"These muffins have no sugar and no fat, but are moist and tasty. Instead of regular applesauce, I sometimes use mango-peach to give the muffins more flavor. Great recipe for diabetics! You can use all white flour instead the whole wheat flour, too." Preheat the oven to 375 degrees F (190 degrees C). Grease a 12 cup muffin tin, or line with paper muffin liners. In a large bowl, stir together the flour, sugar substitute, baking powder, baking soda, and cinnamon. In a separate bowl, mix together the egg whites, mashed banana and applesauce. Add the wet ingredients to the dry, and mix until just blended. Fill prepared muffin cups 3/4 full. Bake for 15 to 18 minutes in the preheated oven, or until the top springs back when lightly touched. Allow muffins to cool in the pan over a wire rack for a little while before tapping them out of the pan. 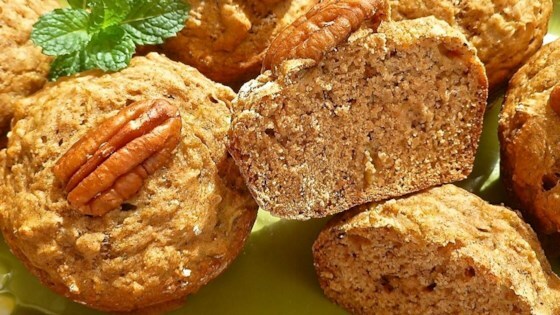 See how to make simple but delicious banana muffins. I didn't have Splenda so I used regular brown sugar and I also used the whole egg. I made these as mini-muffins for my son and he loved them. I will make these again.